Abstract: The increasing price of natural gas and, in some cases, government policies have encouraged the exploration and development of gas from unconventional sources which further have lead to the development of sophisticated technologies for enhancing hydrocarbon recoveries. 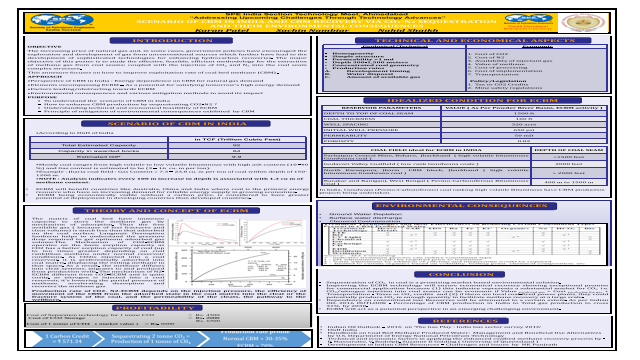 The major objective of this poster is to study the effective, feasible, efficient methodology for the extraction of methane gas from coal seams; coupled with the injection of CO2 and N2 into the coal seam complex structure. This annexure focuses on how to improve exploitation rate of coal bed methane (CBM) .